You know how, when someone you really care about goes away for a long time, your memory forms a lore regarding that person. You remember them as funnier, smarter, wiser and nicer than ever before? When that person returns, you’ve practically canonized them. This has happened to the Vikings with Teddy Bridgewater. Everyone in the organization admires Bridgewater. They were sick when he blew out his knee in August 2016. And now that Bridgewater is healthy, the question that has moved front and center is: When can we get him back on the field? 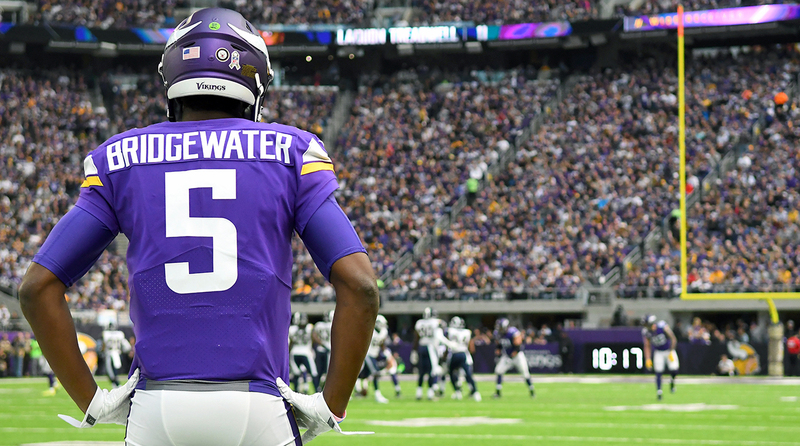 Even though Minnesota is 9-2 and fill-in quarterback Case Keenum has only elevated his surprisingly high level of play since Bridgewater was activated, the conversation about Bridgewater has not disappeared. But it should. We forget that, prior to getting hurt, Bridgewater was a below average starting quarterback. Spit-take if you’d like, but even Bridgewater’s admirers probably felt this way and just didn’t know it. If you ranked NFL QBs 1-32, Bridgewater would appear in the 17-24 quadrant on most people’s lists. To some—including yours truly—he would have been in that 25-32 quadrant. It starts with a meager arm. Bridgewater’s ball spins with little velocity. You’d hear whispers about him leaving receivers open downfield and not attacking tighter windows at the intermediate levels. Quarterbacks who can’t sling it instinctively become dink and dunk artists. Athletically, Bridgewater is on the plus side, but not to the extent that you’d build your offense around his mobility, especially considering that, at 6' 2", 215 pounds, he’s undersized. And awareness-wise, Bridgewater, at best, falls in the “good not great” category. Really what we’re talking about is a smaller, ersatz version of Alex Smith. And this was all before Bridgewater got hurt. No one knows what he’ll be post-injury. Interestingly, Keenum can be described in the same terms as Bridgewater. At 6' 1", 215 and with 33 career starts, Keenum is an undersized, mild-armed QB with athleticism that’s decent but not enough to build an offense around. Where Keenum has differentiated himself is in his decisiveness. When a quarterback has physical limitations, his productivity becomes a function of how soundly he can execute the offense. Keenum has conducted an extremely well-designed Pat Shurmur offense with aplomb. In fact, he’s capitalized on what is one of the best-schemed passing attacks in football. Behind darting playmaking receiver Stefon Diggs and route-running extraordinaire Adam Thielen, the Vikings feature a bevy of route combinations that beat defenses early in the down if it’s man coverage, and late in the down if it’s zone. You see nuanced stack and switch releases to create picks and rubs against man-to-man defenders (a la the Patriots circa 2015). Minnesota’s crossing routes off of these are very effective. Against zone, the Vikings will drop back deeper behind their much-improved offensive line and run intersecting routes, often with an out-breaking angle somewhere, to isolate and out-leverage defenders. Keenum, with the help of Shurmur and first-year quarterbacks coach Kevin Stefanski, has worked diligently to master the whole operation. (Vikings coaches have said—proudly—that Keenum is one of those guys you must kick out of the building late at night.) And when Shurmur’s designs don’t work, Keenum has consistently found ways to buy time and create new opportunities. Remarkably, he’s done this while taking only three sacks over his last seven outings. Bridgewater’s work ethic has also been lauded over the years, but nothing in his on-field history suggests he can match the success Keenum is having right now. Plus, when Bridgewater was playing, Norv Turner was the offensive coordinator. Bridgewater has no live experience in Shurmur’s scheme. There’s still a conversation to be had about what the Vikings should do after this season. Re-sign Keenum long-term? (Some would see this as hoping to catch lightning in a bottle twice, since Keenum’s history suggests he’s not a franchise quarterback.) Make a deal with Sam Bradford? Bank on Bridgewater? (The outsider vote here would be no.) But there should be no debate about what to do this season. The Vikings have the NFC’s best defense and an offense that, thanks to an overachieving fill-in QB, is playing great. And, as long as Bradford is shelved, there isn’t a better alternative on the roster anyway. From standpoint of technique and mechanics, #Chargers WR Keenan Allen is the NFL's best route runner. This was actually written before Keenan Allen torched the Cowboys for 11 catches and 172 yards on Thanksgiving. No receiver is better at setting up and disguising his breaks than the fifth-year pro. A lot of people tweeted back that Adam Thielen or Antonio Brown deserve the Best Route Runner title. I have no problem with either assertion. Both are first-team All-Pro receivers. But if we’re talking about pure route running mechanics, Allen has just a tad more nuance than Thielen. And Brown’s routes are aided by his otherworldly transitional quickness. You certainly don’t dock a guy for that talent, but when evaluating just his mechanics, you must remove it from the equation. Titans running back DeMarco Murray averaged 1.86 yards per carry in November. That’s a problem for an offense built on what head coach Mike Mularkey calls an “exotic smashmouth” ground game. Murray has had slumps throughout his career, during which he struggles with vision. He doesn’t always read his blocks and running lanes well. In Dallas (even though he was prolific), and especially in Philadelphia, this led to him leaving yards on the field. The Titans went 3-1 in November but they won’t prosper in December (or certainly January) if Murray continues to struggle. They’re built on overloaded run-blocking and deceptive design. It’s imperative their primary ballcarrier take advantage of that. Cardinals rookie safety Budda Baker. He’s potentially a second Tyrann Mathieu. The Cardinals have been aggressive and effective with slot blitzes in recent weeks. Baker and Mathieu are used interchangeably here. Baker also has an explosive second gear when he presses his Attack button working downhill. Lions safety Tavon Wilson needs shoulder surgery and is out for the season. That’s a blow, not because the Lions can’t replace Wilson—2016 fourth-round pick Miles Killebrew has played with gradually better speed and decisiveness with each passing month—but because the Lions make good use of a “big dime” package that features Killebrew, Wilson and stalwart veteran Glover Quin. With either Charles Washington or Don Carey now forced to be that third safety, Detroit’s dime package becomes a lot less versatile. There are two types of people: clean freaks and slobs. When forced to live together, a clean freak’s and a slob’s most common battleground becomes the kitchen. Clean freaks do the dishes right after eating, while slobs sit around and wait for food scraps to stick to the plates. This one isn’t a matter of personal preference—there’s a right and wrong. The clean freaks are right and the slobs are wrong, and here’s why: If a dirty dish is to ever be used again, it must eventually be washed. Which makes washing that dish an inevitability. You maximize the value of that dish if you recognize that inevitability and clean it right away. Maybe you don’t need that dish until tomorrow night, but by washing it immediately after tonight’s dinner, you have 24 hours of that dish’s cleanliness. That’s 24 hours that the dish isn’t sitting in the back of your mind, yelling Wash Me! It’s 24 hours where the dish is available to be used on a whim. If you wait until, say, the morning to wash it, you get only 12 hours with that peace of mind. All for the same dish-washing effort. Or, actually, for less effort if you wash it up front, since fresh food scraps are easier to remove than old food scraps. If a dish didn’t have to be cleaned, then maybe the slobs would have an argument. But it does, and so they don’t.